Ships within 10 business days. Please allow up to 3 additional weeks transit time for your item to arrive. Please note: Made to order upholstery items require up to 10 weeks of production prior to shipment. This coffee table blends vintage materials with contemporary style. The round recycled elm top features a unique pattern in both light and dark stained finishes. 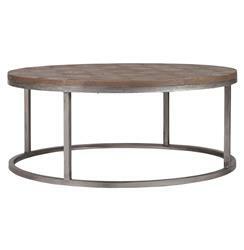 The coffee table’s sleek silver metal base is antiqued with a flat black paint.